This summer, while the kids were far from school and the campuses empty, an unlikely group of men were helping get the parking lots ready for the new year. The team from the Texas Department of Criminal Justice & Huntsville Independent School District. These men scraped, scrubbed and pressured washed off all the old paint before giving the areas fresh coats, leaving the campuses bright, welcoming and safer. According to our Director of Maintenance and Operations, Larry Brown, this type of district-wide painting effort may have been a first ever for the District. It's definitely a first since he's been with the District, and it isn't difficult to imagine that in the past, this over arching effort was too large (and too expensive) of a job to attempt at once. We simply didn't have the money or person power to handle it. There's something very satisfying in rolling a fresh coat of white paint. When you look around the campuses you will see for yourself- they did an excellent job. So the question is, who were these men? Inmates working in the parking lot outside of the newly remodeled Support and Learning Center. They were a team of non-violent offenders, a community work squad from the Wynne Unit here in Huntsville, working under the watchful eye of a TDCJ officers. They worked on each campus when the kids were far from school. Water and portable bathrooms were provided, as well as guarded transportation. Water and rest breaks were the only interruptions, but there was no complaining. 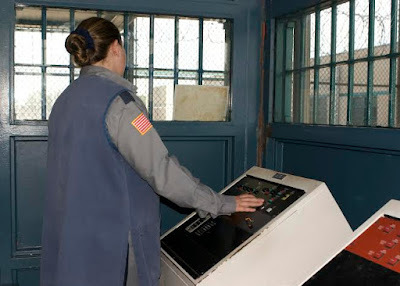 In fact, the inmates mostly worked in silence, focused on the work and doing a quality job. These inmates understood that this opportunity was a privilege. Security and safety is the utmost concern for everyone in Huntsville ISD and the Texas Department of Criminal Justice. So with the approval of Wynne Unit Warden Kelly Strong and Superintendent Dr. Howell Wright and security firmly established, HISD's Larry Brown and Jim Kreier partnered closely with Assistant Warden Brian Smith to ensure that the program went off without a hitch. It's isn't high tech, but it gets the job done. The leadership of HISD & TDCJ understand and agree that these men are incarcerated for punishment for the crimes they committed. This collaborative effort to have these men paint is a decision that makes good economic sense to Huntsville ISD, and we are grateful to have a partner in TDCJ. For a quality fresh start, you have to remove all the old junk. Wynne Unit Warden Kelly Strong also recognizes the potential value for the participating offender. Being a part of a team that accomplishes something worthwhile for the community can be part of an offender's road to rehabilitation and redemption. We want to thank the rest of the TDCJ staff that contributed to the success of the program, particularly Officer Andrews. Thank you to the women and men that work at the Texas Department of Criminal Justice that keep us safe. We also want to take this opportunity to thank the men and women, the moms and dads, aunts and uncles, brothers and sisters of our students, faculty and staff who work for the Texas Department of Criminal Justice here in Huntsville. These men and women go to work everyday to make Huntsville and the entire State of Texas a safer place to live.